As part of preparing for my exams (upcoming next month), I’ve been reading through various NT introductory texts (to the point I’ve grown weary of it!). I don’t know that I’ve read any of them cover to cover, but I’ve read a fair amount of them and have come to like some more than others. Of these many I’ve pored over, such as The New Testament: A Historical Introduction to the Early Christian Writings (Ehrman, sixth edition), Introducing the New Testament (Drane), New Testament Introduction (Guthrie), The New Testament: Its Background, Growth, and Content (Metzger), The Cradle, the Cross, and the Crown: An Introduction to the New Testament (Köstenberger, Kellum, and Quarles), The New Testament: A Historical and Theological Introduction (Hagner), Into the World of the New Testament: Greco-Roman and Jewish Texts and Contexts by Daniel Lynwood Smith, and Encounter with the New Testament: An Interdisciplinary Approach (Pregeant), I have to give the nod to The Cradle, the Cross, and the Crown: An Introduction to the New Testament. While some may balk at this choice for its more conservative bent, it really is a superb volume. Even if you disagree with some of the authors’ interpretations or particular stance on an issue, they have provided fairly substantial arguments for their take on some of the more contentious matters, e.g., Pauline authorship of the Pastorals, apostolic authorship of Matthew, and have made a great effort to treat each book in light of its various contexts. If you haven’t picked up a copy and are looking for a solid NT intro, grab this one (or the abridged version The Lion and the Lamb: New Testament Essentials from the Cradle, the Cross, and the Crown). Read my glowing review of it here. I’ve also begun reading Kregel’s latest NT intro edited by Berding and Williams–What the New Testament Authors Really Cared About–and it’s looking promising so far. It’s not the same type of intro as those mentioned above, but looks to be quite useful for its intended audience. What are some of your go-to intros? I was reading through Romans 1 earlier and was curious how you out there interpret the phrase ἐκ πίστεως εἰς πίστιν. I haven’t read through commentaries or works on Romans lately, so I don’t recall what the prevailing interpretation is (if one is even more dominant than others). δικαιοσύνη γὰρ θεοῦ ἐν αὐτῷ ἀποκαλύπτεται ἐκ πίστεως εἰς πίστιν, καθὼς γέγραπται· ὁ δὲ δίκαιος ἐκ πίστεως ζήσεται. I tend to see this as Paul suggesting a continuity of God’s revealing of his righteousness–from the age of Moses (or the giving of the Mosaic law) to the new age inaugurated at the Christ event. Thanks to the kind folks at Fortress Press for this review copy! I received this copy free of charge in exchange for an unbiased review. In the field of biblical studies, recent years have seen a resurgence of titles concerning one element or another of the Greco-Roman world, many focusing on the Roman empire and reading the New Testament in light of the hulking shadow it cast over the world of Jesus, Paul, and many others. 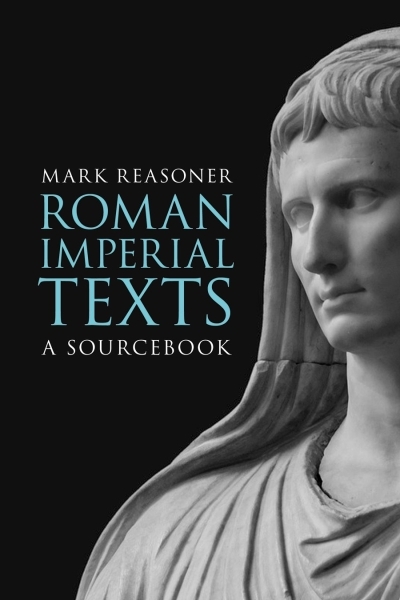 Works that examine particular facets of Roman culture in the first century are certainly helpful, but Reasoner’s volume proves its usefulness not because of extended examination of Roman culture (though there is an ample of amount of such), but by providing relevant texts that depict and describe the Roman emperors and the kingdom they built and expanded. To study and attempt to understand a culture, more often than not the best place to begin is with its literature. Thankfully, ancient Romans produced a treasure trove of material to be mined. Reasoner’s work is comprised of three parts: 1) Emperors, 2) Community and its various components, and 3) the city of Rome. The discussion of the emperors focuses primarily on texts and numismatic evidence that speak of them in terms of divinity, beneficence, and their status as sons of the gods. This, naturally, is important for studying the NT concept of Jesus as the Son of God, though Reasoner does not push terribly hard to convince the reader that Son of God language in the NT is directly related to empirical sonship, though Reasoner does believe it important. For example, Reasoner suggests that the use of the term euangelia in the Priene inscription is the use alongside which one should read the canonical Gospels’ association of Jesus’ birth, life, and teachings (30). Part two concerns community in ancient Rome and how participation in various societal events and customs helped establish and define Roman identity. For early Christians, according to Reasoner, this provided a starting point of sorts for understanding their place in the body of Christ, particularly in light of Paul’s multiple references to such through his writings. The creation of an alternative society, i.e., the church, is illuminated when reading against the various texts here provided by Reasoner. Likewise with the collegium and domus, both of which are important for understanding many things Paul (and others) teach. In part three, Reasoner discusses a few aspects of Rome as a city, particularly as it concerned its far-reaching influence in the Mediterranean and beyond. War, commerce, and games were some of the means by which Rome wielded its influence. Early Christians, of course, lived in this immense shadow and Reasoner briefly discusses how these texts might illuminate references in the NT. One of the strengths of this work is that there is a steady eye on various concepts prevalent in the NT (e.g., Son of God) while discussing the Roman texts. This does not mean that Reasoner deviates from the path by engaging in efforts to demonstrate that certain NT ideas and/or texts are anti-imperial or otherwise; rather, he simply notes these potential connections and provides brief commentary. The reader, then, is given ample food for thought and hopefully ignites a spark to investigate any such connections further, however tentative or substantial they might be. While Reasoner occasionally tips his hand, for the most part he writes with the objective of providing a springboard for further investigation. Selectivity is an unavoidable constraint on works such as this and will perhaps deter some in favor of other more extensive (and expensive) volumes, but for most this volume will serve as a highly accessible and immensely helpful resource for better understanding the imperial context of the NT world. I was reading/translating through Galatians this morning and I happened upon this little grammatical ambiguity in 1:12.
οὐδὲ γὰρ ἐγὼ παρὰ ἀνθρώπου παρέλαβον αὐτὸ οὔτε ἐδιδάχθην, ἀλλὰ διʼ ἀποκαλύψεως Ἰησοῦ Χριστοῦ. The phrase in question is διʼ ἀποκαλύψεως Ἰησοῦ Χριστοῦ. Does Paul mean that he received the gospel at his conversion on the road to Damascus (subjective genitive; by implication the time following that initial encounter) or is he referring to the gospel as it had been circulated throughout his neck of the woods (objective), so to speak? Could it be both? It’s been a long time since I’ve studied Galatians in any depth, so I don’t recall the discussions here. It’s only a minor point in the scheme of the letter, but I was curious how you all might interpret it. Thoughts? Interpreting the General Letters: An Exegetical Handbook by Herbert W. Bateman IV. Everyone who opens the Scriptures to read will invariably read the text in light of their own experiences, biases, etc.—this is practically a given—and we all know the dangers of reading texts without the appropriate sensibilities. Thankfully, scholars throughout history have provided works that serve as guides to help navigate the complexities of texts and this is no more important than when dealing with ancient texts. One might also ask, as many do with yet another volume on a particular subject is released, why do we need another book on this subject? As I’ve mentioned in other reviews, I always welcome new works on any given subject because no one person/team could exhaustively discuss all issues relevant to any given topic, much less resolve all of the issues intertwined. However, one of the dangers in this proliferation of topic-specific works is that many will essentially say the same thing, causing us to ask again if we really need another volume on this subject or that. In the case of Bateman’s contribution to Kregel’s Handbooks for New Testament Exegesis series, there is much to be commended and is an insightful and helpful volume. As the title indicates, Bateman tackles the issues of interpreting the general letters—Hebrews, James, 1 and 2 Peter, Jude (and oddly the Johannine letters, which are typically addressed along with John’s gospel and Revelation, but included here presumably because they are letters). You can expect the standard fare in this volume. Discussion in the first few chapters (1–3) follows fairly typical lines of genre, background, and theological issues that arise and Bateman provides the requisite guidelines on how to identify and assess them in the broader scheme of interpretation. Chapters 4–7 focus more on the spadework of exegesis—translation, grammar and syntax, and interpreting the various components that comprise the letters. Chapter 8 is a bibliography for further reading on the various issues addressed throughout the book. Overall, this is a rather thorough book. Because it’s not a larger hardcover edition, one might think it to be a lightweight in its field—no so (the whole not judging a book by its cover thing, or even its size in general)! While not a highly technical volume, readers without some knowledge of Greek grammar and syntax may struggle with certain sections. This is not necessarily geared for beginners! When it comes to academic works (which this is, though not geared toward professionals or experts), I expect to see notes/references to works with which the author interacts and/or to which the author points the reader for more detailed discussion—you will find both here. Bateman interacts with a fairly broad range of interpreters, the works of whom you will find on nearly every page. While the whole book was generally good and helpful, there were two sections I found particularly so. The first was Bateman’s discussion of backgrounds specifically concerning the relationship between Jews in Greco-Roman culture and how this affects how one reads the letters in question. The second was the matter of pseudonymity, which is an important issue/problem for interpreting the general letters (see pages 51–56). One of the risks inherent in approaching a category of works within the canon is that by assigning a label on the basis of common characteristics, some may assume that all guidelines set out for interpreting apply all the time. However, as any interpreter knows, this is not the case. While Bateman does offer any cautionary words on this matter, it should go without saying that titles such as this are meant to be guides, not authoritative works that provide absolute answers for the questions that arise. This volume will certainly serve as a welcome companion to one’s study of the Scriptures that may be called “general letters” and will be a reliable guide through the dizzying array of issues that the “letters” present, if only in a broad sense.